The Gym at Bishopston offers best in class Life Fitness cardio gear including running machines, cross-trainers, spin bikes. Fitted with their latest Discover tablet consoles you'll be able to surf the web, check in with Facebook or Twitter, or simply catch-up on your favourite TV programmes whilst you work out. Fitness is personal, we know! Your personal fitness journey begins the moment you step into our gym. 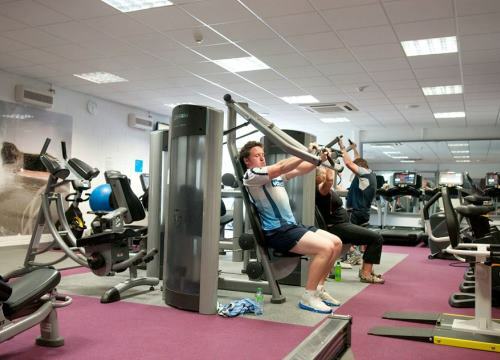 During your induction we'll establish your goals and current fitness level. Our fitness instructor will then personalise a training programme, show you how to use each piece of kit before setting a second appointment to review your progress and amend your programme. You're welcome to catch-up with our fitness instructors to review your programme at anytime, but we've also teamed up with Life Fitness to offer you even more. We've kitted our gym with a mix of their cardio, resistance and functional training machines that allow you to personalise your workouts and remember them using the LF Connect app - simply download to your Apple or Android smartphone, register your details and hook up to our machines to start working out your way. Fitness classes are a wonderful method for staying in shape while having a fabulous time in the meantime. find out more information by looking at our timetable.